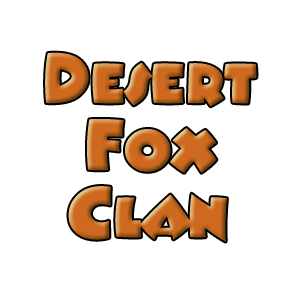 Desert Fox Clan was formed on 21st April 1998 by a bunch of gamers who all worked for Halifax plc. Reubs, Mesmer and Skonley had been holding regular LAN events ever since Doom came out, but it was the introduction of QuakeWorld that started the team based gaming for us. We'd been happily playing at our LANs, unaware of the greater community of online gaming. QuakeWorld CTF5 was about all we did for a year or so. It was in 1997 when EvilGoblin, at the time a member of Mere Mortals, joined our LAN events. He pointed us at BarrysWorld, and showed us how to go about playing online. After joining in the MM practice games for a few weeks, we quickly decided to form our own team and join a league. The natural league for us to join was the MCW, as we were all on modem, and it was hosted at BarrysWorld where we all had dialup accounts. Our first season was a bit of a disaster. The results were awful, but we still enjoyed it and learned a lot. We started to get the hang of team chat, and the use of proxies for location reporting. That really helped, and meant that we actually won a few games in the following two seasons. The next season was when it all came together - we won all nine games to finish top of the division :) And that was more or less the end of our league history. The next season ended with several clans folding as more moved to other games such as Unreal Tournament. Real life commitments made it hard for us to continue with the practice sessions and league nights, so we called it a day. Since then, we've continued to play online but not in any competitive sense. We still hold LAN parties courtesy of DF-Lynx, and we play CS:GO and PUBG when we can find the time.